During one of my many Pinterest pinning sprees I came across a series of photos that showed how to turn a t-shirt into a cat tent. I thought it was the cutest thing, but couldn’t find any step-by-step instructions. Below are the steps I took to recreate the picture collage I had seen. Use your pencil and ruler to mark off a 19in by 13.5in area on your cardboard. Use your pencil and ruler to mark off a slightly smaller area of 19in by 12.5in on your other piece of cardboard. This second piece of cardboard will add extra support to your cat tent. Cut out both pieces of cardboard and set aside. CAREFULLY unravel both wire hangers. Push the wire hanger ends through one piece of cardboard slightly over a half inch from the edge. Remove the wires from the cardboard. This was to get an idea for spacing and placement. Use your masking tape to cover the edges of each piece of cardboard. Place the smaller cardboard piece over the center of the larger piece and tape them together. Use your screwdriver to carefully make holes where your test holes are. The screwdriver is to push through the original holes, since you will need to push holes through the second smaller piece of cardboard that is now taped to the larger piece. Thread the wires back through the holes. When threading one hanger wire you will want to make sure one end is in the lower right hole and the other end in the upper left. There will be about a 1in tail coming out of each hole. Bend these tails and tape them down. Use lots of tape so the wire doesn’t peep through. Repeat step 10 with the last wire hanger placing the ends in the remaining open holes. Make sure the wires create an arch or whatever shape you like. Mine looks like a circus tent. Add tape around the point where the two wires intersect to add stability. Place the cardboard and wires in the bottom opening of the shirt. You will want to push the cardboard and wires through until the neck opening looks like a door (see photo below for reference). Fold the ends of the shirt bottom to close the back of the cat tent. Use 2 safety pins to secure the shirt bottoms. Try to use the safety pins where they will not be seen, you don’t want your cat to mess with them. Safety pin the left shirt sleeve using one safety pin. Do the same for the right shirt sleeve. You are done and ready to share all your hard work with your cat. For test placement of holes. Taping the cardboard together and the ends. Using a screwdriver to finalize the hole placement. Threading the wire through the holes and taping them in place. Taping the ends of the bent wire. Safety pinning the bottom of the shirt after placing the cardboard and wire inside. Pin the sleeves of the shirt. Shirt neck becomes the entrance to the tent. Cat checking out the new house. Cat enjoying her new tent. Another cat hanging out in the tent. If you ever get the chance to attend a BYOB (bring your own beverage) painting class, you should go! I highly recommend them. They are a great way to relax, have fun, and get out of any art slump you might be in. Recently, I attended a couples BYOB painting class. The theme was the Chicago Skyline stylized to mimic Van Gogh’s Starry Night. It was a great subject for a couples project. Normally, in one of these classes you walk away with your own stand-alone painting (example here), but with a couples painting class it is slightly different. As you can guess both people paint their own canvas, which afterwards come together to form a complete image. The fun/challenging part is getting both canvases to match up and appear cohesive. I won’t take you through the whole process in detail since that is boring and painting should be a fun organic experience. Tips: I tend to blend my colors a lot right on the canvas and had to constantly remind myself that I needed choppy short strokes to match Van Gogh’s style. Having the reference image handy helped as a reminder. In order to keep the skyline and swirl flowing correctly from one canvas to the next we kept the canvases touching when adding the white swirl and blocking out the skyline. At a high level the process looked like this, start with the background first. Once all the blue paint is applied (even to the sides of the canvas) take white paint and start adding where the stars, moon, and swirl should go (it helped us to keep the canvases together at this point). Once that’s all dry, add warm colors (yellow, orange, red) over the top of the white. Add reflections and ripples to the water. Now comes the Chicago Skyline being blocked out in black paint (another good point to have your canvases together). Once dry, add white and yellow highlights for sides of the buildings and windows. Touch up anything you want and add your signature. Finally, place the canvases right next to each other, take a step back, admire your masterpiece and cheers to a job well done! Planning the stars and hill with white paint so the next layer of color will be more vibrant. Warm colors and swirl are finished. The final product. Very proud of how our canvases fit together. Obligatory painting and wine picture to sum up the evening. Since joining the website Goodreads I’ve taken on the annual Reading Challenge. It seems most bookworms I’ve met have an annual reading goal in some capacity. Knocking books off the ever-growing TBR pile is a constant struggle, especially if you’ve ever challenged yourself to a “Top 100” list. Five years ago my boyfriend challenged himself to finish one of these lists within a five-year period. It’s taken slightly longer than he would have liked but just this month he has completed the challenge by reading the last book on the list – War & Peace. This is quite the accomplishment! Check out the list he completed here and see how many you’ve read. 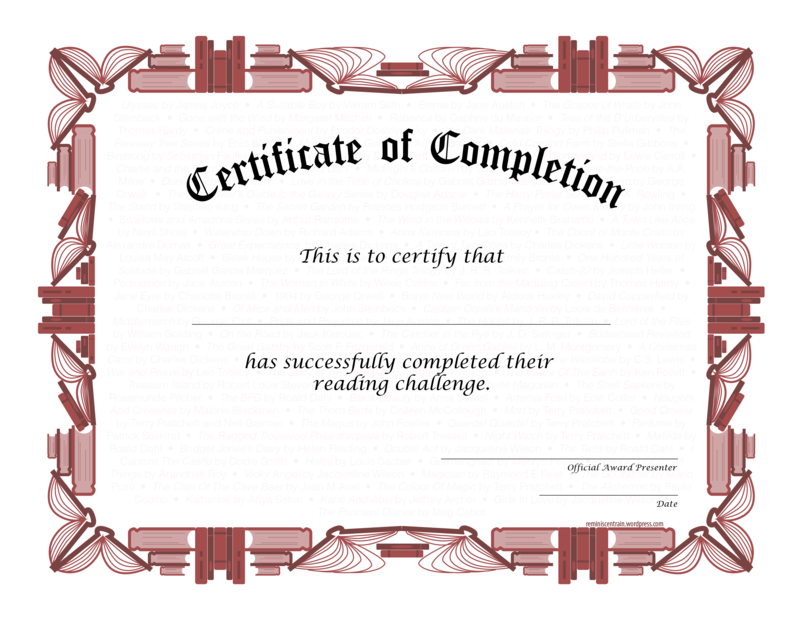 I used Adobe Illustrator to create the certificate. I prefer Illustrator over Photoshop. This way I can scale my custom graphics however and whenever I feel like it without worrying about resolution degradation. 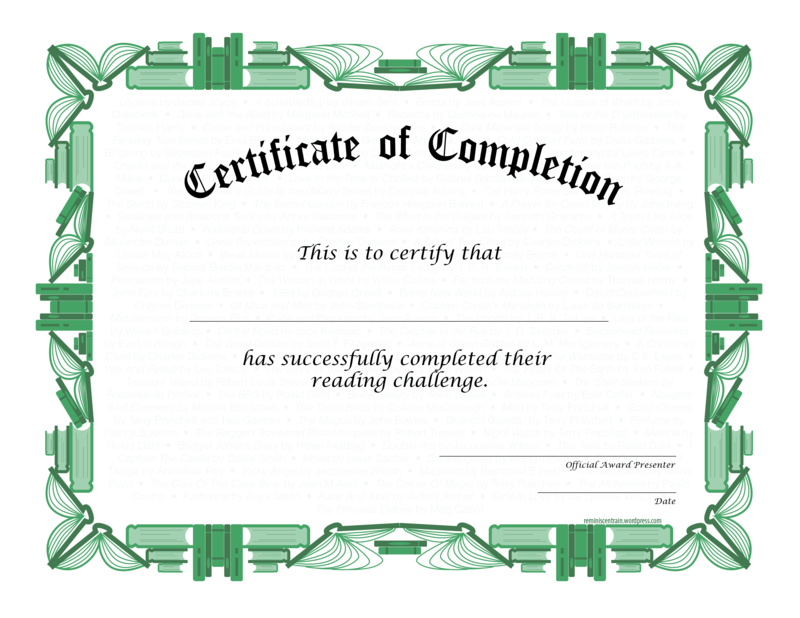 Creating the certificate using Adobe Illustrator. What’s a certificate without a shiny gold sticker? 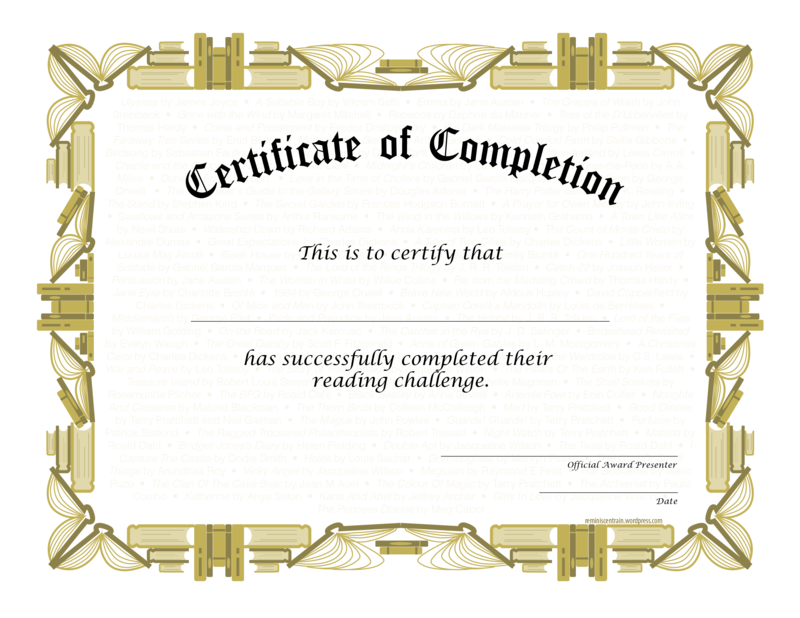 I used Adobe Illustrator again to create a template of what I wanted on the Avery Inkjet Gold Notarial Seals (2 inch diameter). I purchased the gold stickers through Amazon. 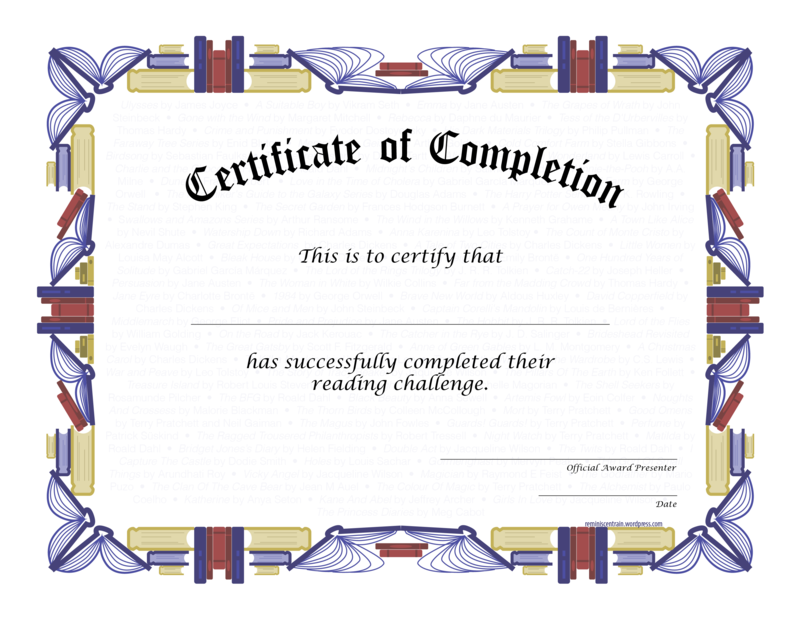 My final product was to be printed on 8.5″ x 11″ paper and that’s what I based my designs and seal size off of. Once the sticker template was printed and cut into a circle I centered it over one of the stickers, taped in place, and used the embossing stylus to outline the template. You need to outline the template quite a few times. Lift up the template periodically to make sure you are leaving a mark on the gold sticker. Close up of the stylus, template, and sticker. 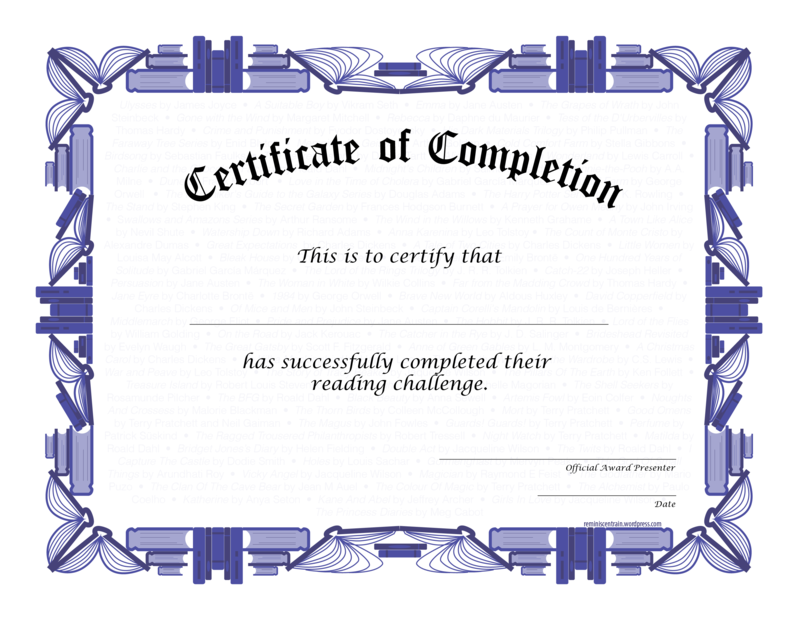 Once that is finished I added it to the printed certificate and then filled out the blank spaces. To make this joke gift more official I framed it before presenting it to my boyfriend. He was very surprised! *NOTE: The file format is a .png with transparency; if you open up in the browser you might see a checkered “background”. This won’t print checkered, it just means there is no background color so it will print faster. Happy reading my fellow bookworms!! May was my one year anniversary with my amazing boyfriend. I wasn’t sure what to get him as a gift. I had been searching and trying to think up something meaningful and homemade, but I couldn’t come up with anything for awhile. Then I came across the “Five Senses Gift.” This means you give five gifts, each specific to one of the five senses. I was intrigued and the more examples I saw I decided this was the route I was going to take. I wouldn’t have enough time to make all five gifts and decided Sight and Taste would be homemade and the rest retail. The “big” homemade gift was for the sense, Sight. I illustrated with pen and watercolor a collage representing some of the year’s highlights. Below is a sketch of the illustration, finished product, and a couple close ups. It was really fun looking through all my photos from the past year and deciding on what items to include in the collage. I have to admit, I really like wrapping presents. It’s like another art project. I made tags for each present (below) denoting which present was for what sense. My boyfriend was really surprised and enjoyed everything. If you are looking for a fun gift theme I would recommend this!